Researchers from the University of Edinburgh’s Clinical Research Imaging Centre (CRIC) managed to reveal the secrets of an intact Egyptian mummy without even having to unwrap it, using a state-of-art 3D hologram imaging process! Found in a tomb in Thebes (Luxor) almost 155 years ago, the Rhind mummy (named after amateur Scottish Egyptologist Alexander Henry Rhind) had been brought by its founder to Scotland and it is housed in the National Museum of Scotland’s collection. Until recently, no one knew what was contained inside the shroud. However, a series of CT scans at Edinburgh Royal Infirmary had already showed the mummy was an Egyptian female aged 25-29, 5ft 2 ins tall, dating back to around 10BC. The mummy was also holding a papyrus scroll in her right hand -presumably the “Book of Breathing”, with instructions for her journey into the afterlife. Still, the scientists could not define the cause of death, although they presume it could be an infection followed by untreatable pneumonia. 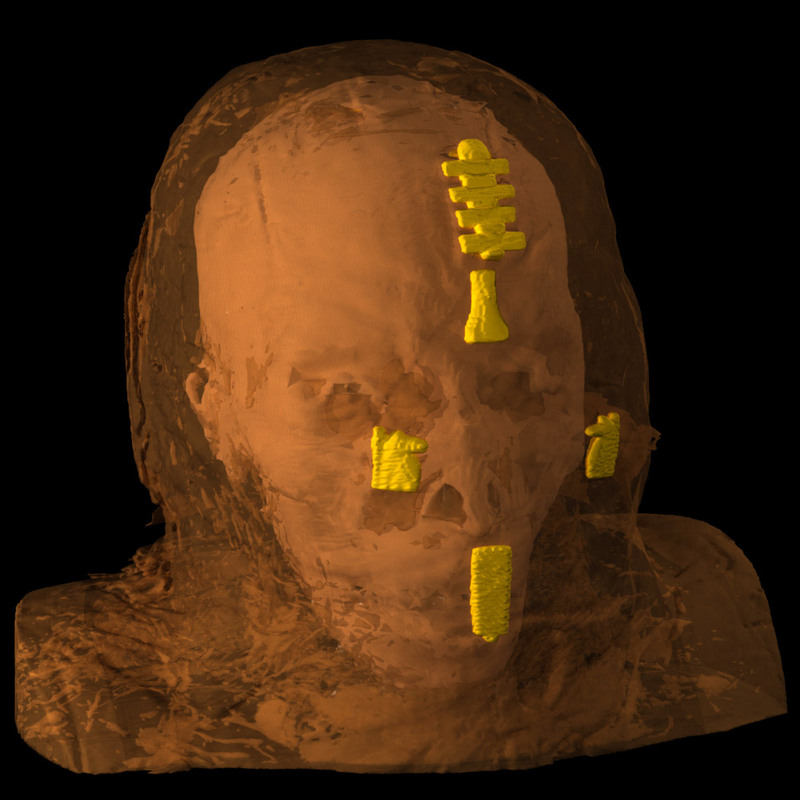 The team at the Clinical Research Imaging Centre, believed they could retrieve more intricate detail on the Rhind Mummy… Enter the Edinburgh-based 3D holographic imaging specialist Holoxica, in order to “assess the feasibility of making a 3D hologram to depict the mummy more accurately”, as Javid Khan, managing director of Holoxica explains. “We collaborated with Dr Martin Connell a visualisation engineer at CRIC and Dr Elena Kranioti a forensic anthropologist at the University of Edinburgh’s School of History and Archaeology. We began by painstakingly piecing together an animated hologram of the Mummy’s head and upper shoulders which reveals different layers of visual information as the viewer of the hologram moves from left to right. “For example, the first layer is the wrapping shroud, which ‘peels’ away to reveal her face. This is followed by the skull. The ‘outer wrapping’ is encrusted with jewels and gold amulets which are visible from angles and, most intriguingly, a metal scarab-shaped cap was placed on top of the skull during mummification, can also be seen in great detail.